Alfred Hitchcock’s suspense thriller “Rear Window” is revered by many as one of the director’s finest films. You would have a hard time getting me to disagree. “Rear Window” is a voyeuristic mystery picture that takes place in one single confined location and is all shown from the perspective of the main character. It’s an interesting approach to storytelling but one that’s very effective. There are many recognizable Hitchcockian touches throughout the picture yet it retains a uniqueness that separates it from most of his other films. The story is seen through the eyes of L.B. “Jeff” Jeffries, an accomplished photographer who is confined to a wheelchair after breaking his leg while on assignment. He spends his time observing his neighbors through the window of his small Greenwich Village apartment. It grows into an obsession for him as he becomes infatuated with what he sees while peeping through their windows. Jeff is a man filled with insecurities and he seems more comfortable living out his life through the lens of his binoculars. In many ways he’s a sad individual who has so many good things within his grasp yet he lacks the confidence to reach out and take them. He begins to suspect a possible murder in one of the apartments and the second half of the film follows his attempt to either prove it or be disproved. Hitchcock hits head-on the peeping tom mentality that certainly existed then but that’s even more prevalent in today’s reality tv-fueled society. Jeff crosses the boundaries of simple curiosity into full-blown voyeurism and we are right there with him. I found myself just as riveted by what’s on the other end of the binoculars as he was. Several people try to tell Jeff what he’s doing is wrong including his beautiful girlfriend Lisa (Grace Kelly) and his home nurse Stella (Thelma Ritter), but even they fall victim to this creepy temptation. Yet it’s hard to look down on these three characters. Hitchcock exposes some levels of the same voyeuristic compulsions within the audience as we watch things unfold with the same curiosity-driven intensity as Jeff, Lisa, and Stella. Hitchcock causes us to ask if we’re really that different from them? I was also intrigued with the way Hitchcock introduces and develops some of his characters. We get to know several people simply by watching them through Jeff’s window. There’s the beautiful Miss Torso, a dancer who occasionally practices in her undies and parties with several male suitors; Miss Lonelyhearts, a sad, depressed woman who has dinner dates with imaginary men; Mr. Thorvald and his bedridden wife; a struggling songwriter, a newlywed couple, and several others. What’s amazing is that we learn a lot about these characters simply by what we observe. It’s a beautiful method of storytelling that adds so much to the picture. 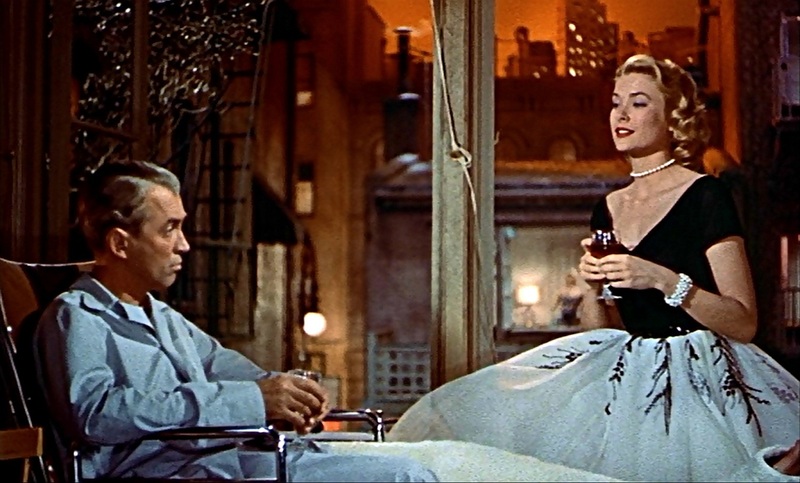 “Rear Window” was filmed on what was at the time the largest constructed set at Paramount. The entire picture takes place in this elaborate neighborhood and, with the exception of a small courtyard, it’s close-quartered construction gives it an almost claustrophobic feel. Hitchcock’s camera sleekly captures the characters as they move from window to window and down strategically placed hallways and alleys. Equally impressive is his skillful use of lighting combined with sound that’s centered around a natural ambiance. Simply put, “Rear Window” is a technically savvy picture that accomplishes a lot within a small compact environment. For my money “Rear Window” is some of Hitchcock’s best work. It’s straightforward and mysterious at the same time and features characters that are more complex than they appear on the surface. It’s really a simple story that’s a little slow out of the gate but soon has you peeping over Jeff’s shoulder gazing into the living rooms of his neighbors. The intensity ratchets up in the final few scenes and the payoff is very satisfying. “Rear Window” is certainly near the top of Hitchcock’s resume and features a special brand of artistry that’s impossible to dislike. This entry was posted in Classic Movie Spotlight, Movie Reviews - R and tagged alfred hitchcock, grace kelly, jimmy stewart, mystery, paramount, raymond burr, rear window review. Bookmark the permalink. Great review! Really enjoyed watching this film last night. Watching people can be a real addiction and I loved how quickly Stella and Lisa were pulled into Jeff’s habits as well. Straight from the opening credits, I loved the set Hitchcock developed for this and it worked fantastically well. Appreciate the kind words. I adore Rear Window and Stewart’s performance is fantastic. You’re right, it does wrap us up in something that everyone has done at some point and that’s easy to get caught up in. agreed, it is superb and one of my favorites (both of Hitchcock and of all). I’ll never forget that Thorwald look, straight at us. Yes!!!! That look is classic!! !